Did you hear that H&M Home is opening? 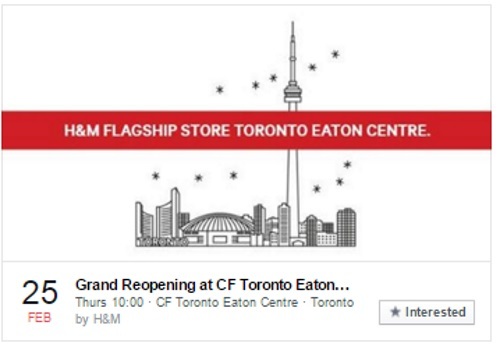 The H&M at the CF Toronto Eaton Centre has been newly expanded and renovated to a flagship store including an H&M Home department! This Thursday, January 25 starting at 10am is their Grand Re-opening Event where you can win up to $500 off your purchase on opening day! The first 300 people in line receive an “Access to Fashion Pass” valued up to $300 to which they can apply to their opening day purchase (values range from $10-$300). Plus see TV's Liz Trinnear, the host for the morning! While you shop dance to the beats of guest DJ Jillionaire of Major Lazer followed by DJ Four Korners of the the Toronto Raptors. Enjoy a gift with purchase while supplies last. Plus enjoy opening offers all weekend long! The store will continue to carry fashion for ladies, men, teens and kids, plus the new Beauty Department!